One of the main issues in a bathroom stems from the fact that hot showers take place in them. These hot showers create damp areas that can lead to mold, mildew, and a pretty stinky odor. The job of the bathroom fan is to remove these stale odors and the humidity that may cause it. If you are tired of the way your bathroom smells or you are tired of dealing with mildew, why not take a look at our ultimate guide to the best bathroom fan reviews. Perhaps it is the solution you have been waiting for. Check out the table below or skip to the best bathroom fan reviews now. 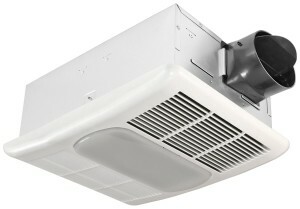 This combination heat fan is designed to be quieter, smaller, and easier to install than most. It features a tubular, stainless steel heating element which has chrome wire and magnesium oxide to increase heat transfer. Its blower wheel pulls air from both sides to allow more air into the fan. It has a light and a nightlight on it. According to the bathroom exhaust fan reviews for this fan, it is easy enough to install for someone who knows only the basic handyman skills. Another Panasonic fan, but this one does not have a light or the heater. However, it is still very quiet to use. It has a power rating of 120 volts and 60 Hz. It mounts to a ceiling easy thanks to its housing having a double hanger bar system. The grill attaches directly to the housing after you have it locked into your ceiling. 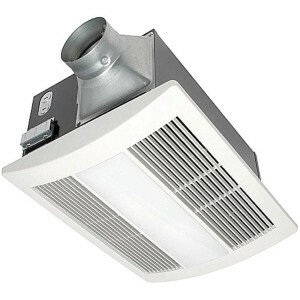 This is perhaps the best bathroom exhaust fan for anyone who wants just a simple fan to remove odors. This fan operates at 1.3 sones which means that it is reasonably quiet. It has a built in thermostat to regulate temperature. It uses a brushless motor and resists corrosion so that it will last you a very long time. 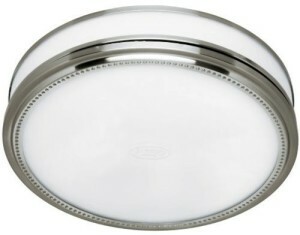 It is lighted and great for most sized bathrooms. This round fan doubles as a round light. It is a quiet bathroom exhaust fan that has a beaded design. It reduces moisture and humidity while it circulates air. It is ideal for use over a tub or shower. There is also a built in night light so that you do not have to turn on the overhead light in the middle of the night when nature calls. This is the fan that does not look anything similar to a bathroom fan. It is a powerful bathroom fan that doubles as a light. 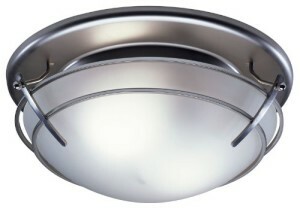 The light itself has a frosted glass shade to cover it and the entire fan assembly has a satin nickel finish. It is all corrosion resistant. The light fixture plugs in, there is a polymeric blower wheel, it is contained in a galvanized steel housing. It has mounting brackets to make installation easier and accurate. The bulbs for the light should be a maximum of 60 watts and it uses two candelabra bulbs. When it comes to bathroom fans, you are not restricted to only one or two types. There are a lot of options. 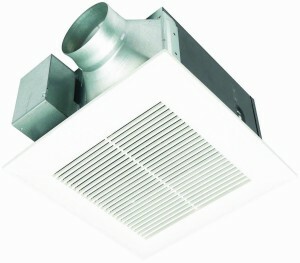 You can choose from a ceiling mounted exhaust fan or a wall mounted one. There are inline exhaust fans or fans with lights and heating built in. You may also choose different sizes of a fan, depending on how much space you have available. Which is Best One for You? If you have an area that seems to stay particularly damp, you may choose to have an inline fan as a shower fan. If you have a tiny bathroom and you do not want to have a fan on your ceiling as well as a light, you may choose to have a lighted fan. In cool temperature areas where you may step out of a hot shower and into a cool bathroom, a fan that can keep the room warm may not be a bad decision. A bathroom that is located in a central area of your home or on the bottom floor, may not be able to use a specific wall mount or ceiling vented fan because of a lack of ability to have it pull odors out. In short, for you to figure out which type will be the best bathroom fan for you, you must know what you are dealing with. From there, you should read through all of the bathroom fan reviews you can find. Eventually, you will find the one that works best for you. Copyright text 2018 by Sons of a Plumber.